Empty angel food cake mix and regular cake mix boxes into one gallon size bag. Seal bag and shake to combine cake mixes together. Scoop three tablespoons of combined cake mix into a small ramekin (bowl). Add two tablespoons of water, stir until combined, and microwave for one minute. (3, 2, 1 = 3 Tbs cake mix, 2 Tbs water, and 1 minute in microwave). :) Remove and add a dollop of cool whip or 1 to 2 Tbs of Betty Crocker Whipped Icing (any flavor). Enjoy Enjoy Enjoy!!! If you'd like a printer-friendly version of this recipe, Click Here. These wonderful potato appetizers are the perfect bite size snack to fill you up without filling you out! Made with sautéed seasoned chopped kale, it's a very tasty snack that's packed full of healthy goodness. Enjoy at your next get-together with friends or family. Preheat oven to 375 degrees. Cut the potatoes in half and place on a baking sheet. Bake for 45 minutes. Meanwhile, in a large skillet, heat olive oil over medium-high heat. Saute' onions and garlic for about 5 minutes. Add the kale and season with salt and pepper. Saute' for about 5 minutes, until kale has wilted slightly, stirring constantly. Remove skillet from heat. Test potatoes after 45 minutes by piercing with a fork. The fork should pierce the potato fairly easy. Remove potatoes from oven and cool slightly. Turn the oven off and turn the broiler on high. Scoop out the insides of the potatoes with a melon baller or small spoon. Place insides of potatoes into a food processor along with the sautéed kale, garlic, and onions and pulse until combined and finely chopped. Carefully spoon the mixture back into the potato skins and place the potatoes in the broiler oven until heated through and slightly golden on top. Remove and sprinkle with a little salt, Goya Adobo seasoning, or a little bit of parmesan cheese (not more than an 1/8 tsp. on each half). Enjoy! If you'd like a printer friendly version of this recipe, Click Here. Everyone's Irish on St. Patrick's Day! These delightful cupcakes, with "Tequila Lime Buttercream" icing, are addicting; and not because of the Tequila. ha! If you have a sweet tooth, look no further than the bowl of frosting. Very sweet and satisfying, but don't forget to put it on the cupcakes! A recipe you're sure to enjoy! Preheat oven to 350 degrees. In a large mixing bowl, combine cake mix, vegetable oil, and applesauce. Add eggs and mix well. Spoon batter into cupcake/muffin pan, two-thirds full (using either paper cupcake holders or just spray the cupcake/muffin pan with Pam cooking spray). Bake for 13 to 15 minutes or until a toothpick comes out clean when inserted into the middle. For icing: Cream the shortening and butter with a mixer. Add the vanilla, lime juice, zest, and tequila. Mix until combined. Slowly add the powdered sugar until all combined and whip the frosting for about 3 minutes until it starts to get fluffy. Add green food coloring (as many drops to suit your desired color). 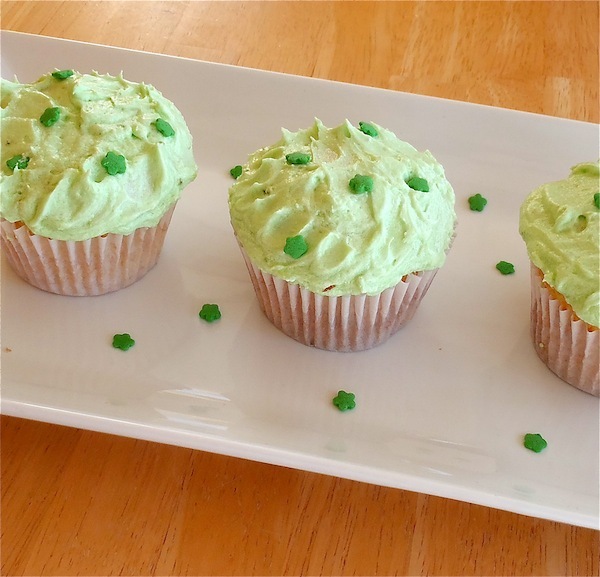 Frost your cooled cupcakes with tequila lime frosting. Enjoy! If you'd like a printer-friendly version of this recipe, Click Here.